This workshop offers a safe and comfortable place to begin the conversation about race. It deals with the three elements of talking about racism that bring on anxiety: fear, ignorance and guilt. The workshop facilitates a discussion that allows for a discovery of one's racial history and finding one's own voice in the conversation on racial issues. Copies of the book Racial Sobriety: A Journey from Hurts to Healing by Clarence Earl Williams are being offered for sale at the discounted price of $15 through the Women's Center. Although entirely optional, you may want to read the book in preparation for attending the workshop. To purchase a copy of the book, you may mail a check and pick up your book at the Women's Center. Please make check payable to Linda Allen. 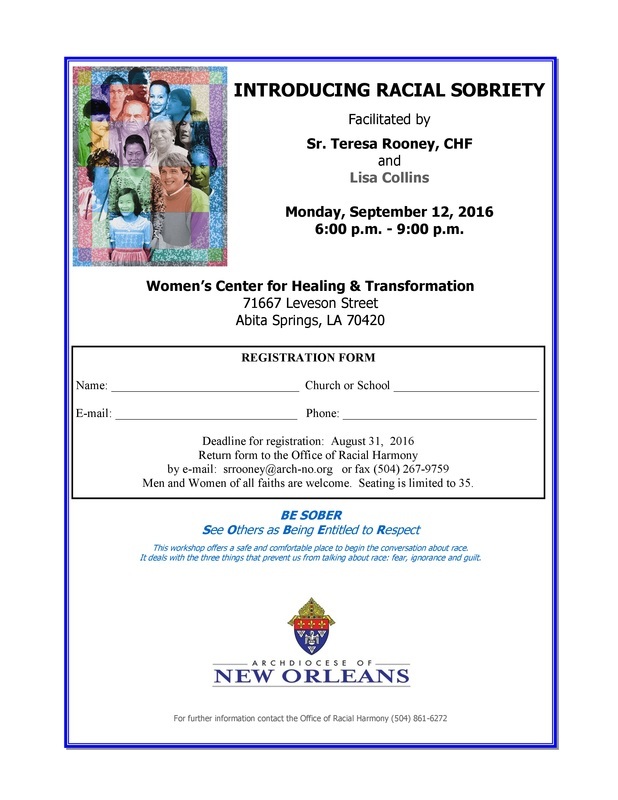 Registration: Download the registration form below and return completed form by email to the Office of Racial Harmony: srrooney@arch-no.org or fax to (504) 267-9759. Seating is limited to 35 - register today! the Office of Racial Harmony (504) 861-6272.